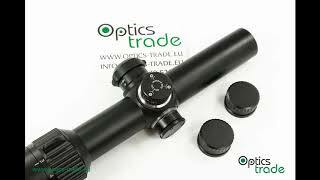 Very good support and advice from Matheus at Optics Trade. I am very happy with the purchase of this well designed and well built scope. You know at once you have a quality product which is built to last. Ta Docter je prvi daljnogled pri katerem sem se odločil, da bom raje investiral nekoliko več in kupil vrhunski daljnogled. Ni mi žal, saj se razlika res pozna in sedaj sploh težko uporabljam svoje druge puške, na katerih imam daljnoglede nižjih cenovnih rangov. Slika je enostavno bolj čista in svetla, kot da bi pri mojih ostalih daljnogledih gledal skozi umazan polivinil. This Docter is the first scope by which I decided to invest somewhat more and buy premium product. I am not sorry I did that, since the difference is immediately noticeable. I am now hawing problems using my other rifles with scopes or lower price class. The picture in the Docter is sharper, clearer and bright. In comparison pictures in my other scope look like watching through dirty glass. This scope is better than all in 1000 EUR class and can even compare with the best from premium class. Field of view, eyebox and edge sharpness is really great, only the dot is not as birght as in Swarovski. The price is however much lower.